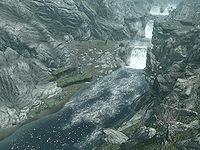 The Karth River starts in the Reach and runs into Haafingar, emptying into the Sea of Ghosts near Solitude. 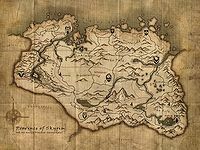 At least three sources converge around the Karthspire Mountain to form it, including one near Markarth and another at the infamous Bard's Leap. It forms a deep schism in the landscape, with high cliffs along most of its eastern side and the mighty Druadach Mountains to the west. Like the surrounding area, it is tumultuous, with many rapids and falls. The famous Old Hroldan Inn is a stone's throw from its waters, and as it flows north, the town of Karthwasten can be found on its western shore. In Haafingar, it passes by Dragon Bridge, and underneath the famous bridge itself, before it reaches its end, where it helps form the marshes of Hjaalmarch. The river and its tributaries carve gorges running through the entire central part of the Reach. For more information, see the Skyrim article. This page was last modified on 16 May 2018, at 17:12.